In his latest bizarre concoction, Dorsey picks up - sort of - various plot strands from his earlier books, including Florida Roadkill, Hammerhead Ranch Motel, and Orange Crush. There's still the matter, you see, of the briefcase full of cash, and still unresolved are the stories of Serge Storms, the serial killer and history buff; Johnny Vegas, the startlingly handsome virgin; Jethro Maddox, the Hemingway look-alike; and Paul, the Passive-Aggressive Private Eye. Fans of Dorsey's magnificently off-kilter adventures will be thrilled to rejoin these characters and to meet a host of new ones, including Mr. Granda, the leader of a down-and-out drug cartel who is looking to buy a submarine, and Ralph Krunkleton, one of America's very worst novelists, whose novel The Stingray Shuffle features prominently in the goings-on. A brilliantly constructed romp that is part thriller, part farce, and entirely, gloriously, deliriously wacky. There are three types of audiobooks that I find appealing: 1. Books I've read in print that I love and want to revisit in audio; 2. Movies I love and want to hear in their original literary versions; 3. Books that are fun. Stingray Shuffle falls into the latter category, a virtually can't-miss category because the main criterion is simply that they are fun. And Stingray Shuffle is most definitely fun. A reliable sub-genre of fun books are comic crime capers set in Florida. The author I've read a lot of, widely known, is Carl Hiaasen. Tim Dorsey, lesser known, is Hiaasen on steroids. Or drugs, more generically. 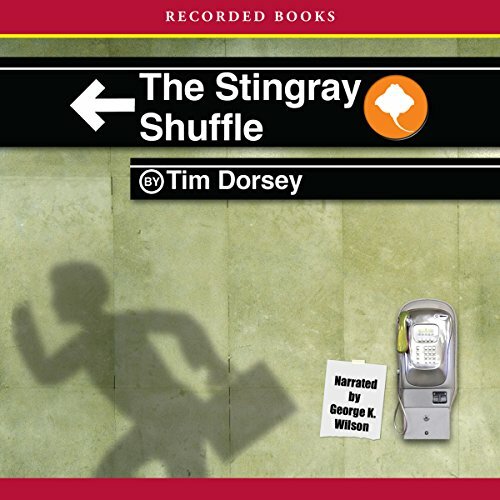 Stingray Shuffle completes a series of three books that began with Dorsey's first two, Florida Roadkill and Hammerhead Ranch Hotel, in which his omnipresent protagonist, Serge Storms, pursues a cache of $5 million cash. In Stingray Shuffle, we find out why he wants the money. Serge Storms, what a creation! A chemically unbalanced sociopath with an encyclopedic knowledge of all things Florida, a fairly righteous moral compass, and a knack for creative killings. Serge gets to go on a number of rants in each book, whether in court defending himself or in the car telling stories or recounting Florida history. George Wilson captures his manic voice perfectly -- for me, having read Roadkill and Hammerhead Ranch in print, I can say unequivocally that Wilson's Serge is far better in audio. Despite Serge's overriding and sometimes overbearing presence, the beauty of Dorsey's books (like Hiaasen's) is the diverse spectrum of characters. Stingray Shuffle does not disappoint with its hypnotist, book club ladies, bad author, bumbling cartel thugs, and the return of Johnny Vegas, reluctant virgin. As good as he is as Serge, Wilson does a great job with all these characters. He is a prolific audiobook narrator, including many of Dorsey's as well as many of Hiaasen's titles. If you're new to this genre, you might be better off starting with Hiaasen or one of the other notable Florida authors (John D. MacDonald or Dave Barry, for example) and move on to Dorsey when you want to take it to the limit. He is definitely farther out there than the Dry Tortugas (which figure into the climax of his first novel, Florida Roadkill). But if you think you can handle something this extreme, go for it, it's a hoot. Fun. Dexter has a legitimate job. Serge lives on the proceeds of crime. Dexter's victims must meet certain eligibility requirements, defined by "Harry's Code." Serge's victims just have to really piss him off. Dexter has a routine and a ritual way of killing. Serge doesn't use the same method more than once. Dexter stays to the end. Serge usually goes away while they're still alive, and leaves them with a slim (practically non-existent) possibility of escape. Dexter thoroughly cleans up afterward. Serge leaves bodies and parts strewn all over Florida for others to find and deal with. Dexter keeps a box of slides with blood samples of all his victims. Serge keeps a box of historical Florida souvenirs. Dexter talks to his playmates for maximum terror and mental anguish while he works on them. Serge entertains his victims with pleasant banter while setting up his devices, which practically amounts to the same thing. Both rely heavily on duct tape. Would you consider the audio edition of The Stingray Shuffle to be better than the print version? I am sure it is. The tongue in cheek performance made me laugh and groan. Will definitely be reading some more Dorsey. It was not what I expected. Actually it was better than expected. Dorsey never ceases to entertain- and then some. Dorsey never ceases to entertain- and then some. The intricacy and links between characters are genius. Most definitely, especially one who liked Carl Hiaasen books. Very similar writing styles. Serge, he is so random...you just never know what he will say or what will happen to him next. This was my first book by George K. Wilson. I chose it because I love Carl Hiaasen books and read Wilson is similar. I'm going to check out some other titles by this author. Hope I enjoy them as much as this one. What disappointed you about The Stingray Shuffle? The story was a disjointed mess. The characters were equally a mess. I kept thinking it might improve. It did not. I could not finish listening. What character would you cut from The Stingray Shuffle? Where does The Stingray Shuffle rank among all the audiobooks you’ve listened to so far? Oh, yes.....the mystery train was a hoot! What made the experience of listening to The Stingray Shuffle the most enjoyable? His sense of humor, the reoccuring characters, the insane trivea just blows me away. Creative story line. Some carry over from earlier books about the missing 5 million. The substory of the forgotten author and how his books become popular again because the coke dealer begins using them for distribution. And there's more, but i don't want to spoil the surprise. I hope I'm not mixing up books, because I'm hooked on Dorsey and am currently on book 10, can't get enough. Serge went to New York City to catch a train to, surprise, Florida. He stayed at a hotel our family had just stayed at, and I learned all kinds of trivea facts about that hotel that I hadn't knew before. Stick with Dorsey,. His audiobooks can be hard to follow because of the way he has 3-5 stories going and jumps between them. They all merge at the end. If you're driving, you'll have to repeat a chapter once in a while if your attention drifts due to traffic.